As a high school student, Dr. Olajide Kufoniyi (Jide) was fond of mathematics and was good at it. But how does one transfer skills in understanding a world of abstractions into professional opportunities in the tough world called reality? One opts for a career in surveying − and that is precisely what Jide did. But he was also curious about new technologies and how they could aid the further development of his home country, Nigeria. This brought him to ITC, the Netherlands, for two long periods: first between October 1986 and April 1989 to pursue a PGD and an MSc in photogrammetry, next from January 1992 to May 1995 to conduct Ph.D. research. Jide revisited ITC fairly regularly after that − most recently to attend the seminar on “Capacity building in disaster geo-information management in developing countries”, which was held from 23 to 25 September 2009. We were curious to know how education at ITC had helped to shape his career. Starting with the first degree in geography and after a postgraduate diploma in surveying from the University of Lagos in January 1983, Jide (born 1954) went to work at the Federal Survey Department of Nigeria. His duties included the demarcation and survey of boundaries, including the Nigeria/Benin boundary and the boundaries of the newly created Federal Capital Territory (FCT Abuja). He became involved in photogrammetric mapping. The technology impressed him a great deal and triggered the desire to pursue further education abroad. As he says, “In 1986 I applied for an EU fellowship programme with, as preferences, University College London (UCL) for a one-year MSc programme and ITC for a 2.5-year PGD/MSc programme.” ITC was the first to grant admission and, when the arrangements had already been completed, he also received notice of UCL admission. “To stay outside my country for more than two years, yeah, that’s a long time, but I’ve never regretted my choice. The education at ITC was thorough, and the mix of education and training benefits. After having learned the concepts, I could practise them immediately − a perfect preparation for later professional activities.” After nine months into the course, Jide’s wife and newborn daughter joined him. His second child was born in Enschede. 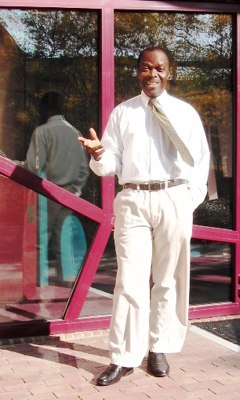 Jide is currently the secretary-general of the African Association of Remote Sensing of the Environment, and also the ISPRS regional representative for Africa.